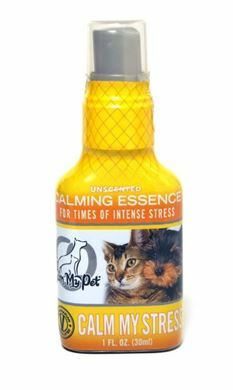 Calm My Pet Vibrational Essences Capture the Energy of Nature to Help Balance Emotions. Vibrational water energetically stores information and has a structure which can have a huge impact on how your cells interact with emotions, nutrients and proteins. Essences work primarily on the energy bodies and cells of the physical body. When an essence is used, a specific vibration is released within the animal's energy field that resonates balance and calmness. CALM MY PET Vibrational Formula CALM MY DOG has no taste or scent, and acts on a subtle energy level. 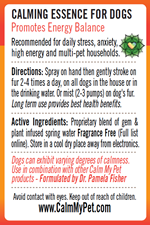 Uses: Energy balance and calm for daily use in all types of dogs. Essence goes into effect within a few minutes and can be reapplied as often as needed. 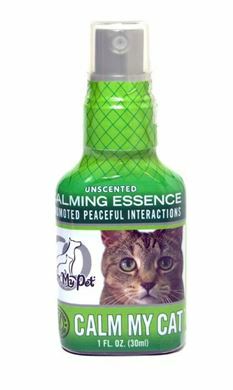 This unscented spray can help to create more peaceful interactions between pet family members. Helps with stress, worry, anxiety, trauma, car trips, vet visits, grooming, boarding, shows, storms and visitors. Sometimes initial changes can be subtle, with additional health benefits seen during long term use. APPLICATION: Shake before use. For first application, spray on hand then gently stroke on back several times daily or as often as needed. Use liberally. Alternatively, hold spray approximately 8 inches away from your pet misting lightly over your dog’s back. Calm My Dog can also be sprayed into their water bowl. Reapply daily and before, during and after stressful events as often as needed. This product is wonderful. One of my male dogs was recently attacked by my other male dog. Emergency surgery and 15 staples were required for the dog that was attacked. All the other dogs in the household - total of 4 - were upset. Calming Dog Essence helped all of them. I sprayed it is the palm of my hand and massaged it into their fur. It certainly calmed them. When I added the Calming Music, the combination worked wonders. 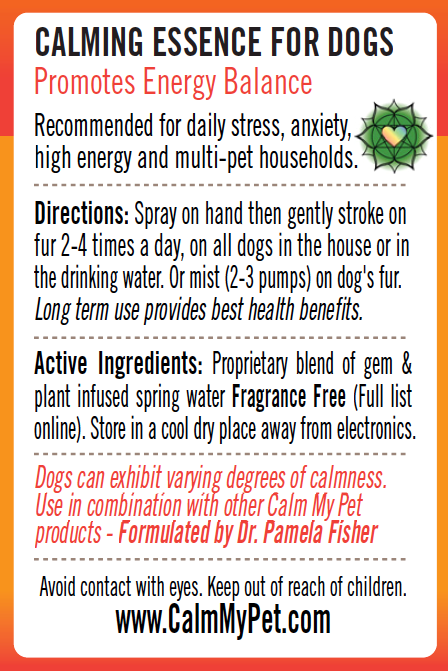 I have to confess there were doubts that anything would have a calming effect on my dog, but this product really works. It's not a "sedative" so don't expect your dog to chill out completely at the vet or at the groomers, but it certainly seems to lessen his stress. I also pump a couple sprays on him before our walks and we both can now have calm conversations, instead of stern corrections, as we get our daily exercise. 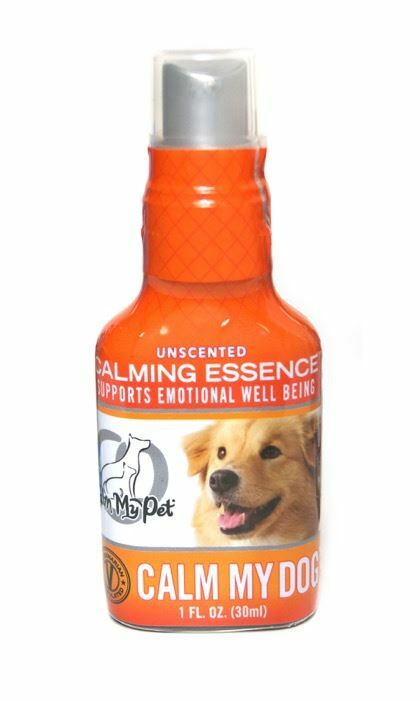 I'm 66 years old, so who knows, the Calm My Dog Essence could be working on me too (LOL). I do keep a good supply on hand -- wouldn't want to run out of it!